I love Christmas. But this is the first tree I’ve had in 5 years. I’ve found ways to rationalize away not having one year after year. For a few years I was either traveling or working out of town for Christmas. Scott usually spends the holidays with his family in Illinois and I’m always at my folks’ in Jersey for Christmas. Besides that, my apartment is small and the behemoth old artificial tree I inherited from my parents is really too big for the space. Real trees are a hassle to drag up the two flights of stairs to my apartment and even worse to lug back down. Plus the old-fashioned radiator heat in apartments like mine are not exactly kind to live trees. But Scott will be spending Christmas Eve with me this year so I thought maybe, just maybe, I’d put up a Christmas tree this year. While on a shopping trip to New Jersey this weekend, Scott and I hit Target--one of our guilty pleasures. I figured I’d check out what kind of fake trees they have for sale. It was a veritable forest. Blue Spruce, pre-lit, Frazier furs–you name it, they had it. But investing a couple hundred bucks for a really nice one just didn’t seem right even though another shopper there informed us that if we amortize over a few years it’s way cheaper than buying a real one every year. He had a point. Still, that kind of extra do-re-mi at the holidays is hard to justify. Then I saw this little tree--a 6-foot Randolph Pine. It was nice and narrow for my little apartment and even though it would be dwarfed by the 11 foot ceilings, I figured I’d set it on a milk crate or something. On sale for $13.99 it was the cheapest of the lot and looked it, too. But as Charlie Brown thought of his little tree, all it needed was some love. So that was that. Off we went with our $14 tree. An evening of unpacking ornaments and strolling down memory lane produced the results you see above. I went to bed happy and satisfied that it would indeed be a Merry Christmas this year. Then this morning I turned on NPR and heard an interview with some expert who went on and on about how artificial Christmas trees from China would kill us all. Mine, of course, was made in China, hence its rock-bottom price. These trees are made from PVC plastic which release harmful chemicals that cause cancer and birth defects. They are dangerous to factory workers and consumers alike. What’s more, these trees will outlast us all either in a landfill or even incinerated they release their toxins back into the environment. Add to that the petroleum used to ship these trees from China and you have the very cause of global warming itself–my $14 Christmas tree. Oh well, I guess it’s a locally, organically grown tree for me next year. Happy Holidays everyone. How absolutely lovely! Your tree, not the part about global warming. I heard that interview, too (while I was moving my car -- alternate side parking day here) and boy, how utterly depressing. Even poor Brian Lehrer seemed defeated by the end of it. I guess we'll buy a real tree and string some cranberries and popcorn. Something tells me Charlotte will much prefer Uncle Michael's tree with all the bling. 11 ft ceilings? Lucky you! What a beautiful tree!!! 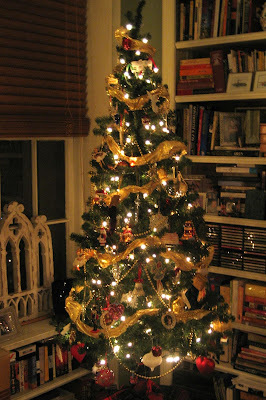 I'm a softie for Christmas decorations too - so I'm glad you get to have a tree this year. Sometimes you have to pick your battles and love the earth in some other way. Just leave a window cracked open so you and your unborn child don't suffer health effects. It's beautiful! See how far a little love will go? I like your $14 "environmental terrorist" tree. You did an excellent job decorating it. I have an artificial tree. I have to have a fake one since I'm allergic to real Christmas trees. Why that tree is simply contributing to a higher "rapture index," consider it a favor to all your Christian friends and neighbours!